I’ve Tasted 4G Speeds, and They Were Good. I’ve never had much luck with Internet speeds. That’s probably because unlike most of my geek brethren I always seemingly forget to check the distance to the nearest exchange from the place I was looking to rent or purchase, something which is now top of my list. Heck even my parents who live in a rural area outside Canberra manage to get better speeds than me thanks to their short distance to their exchange, even though my line of sight distance is almost equal to theirs. It’s still a worlds away from the dial up that I used to make do with but I know there’s a whole other world of faster speeds out there that are just tantalizingly out of reach for me. At the top of the list is the the holy grail of Internet connections in Australia: the National Broadband Network. Whilst it might be in the realms of fairy tales and unicorns for most people in Australia I know a couple people who’ve managed to get themselves on the service thanks to being in the right place at the right time. From what they tell me its everything that its marketed to be with extremely fast speeds that aren’t dependent on distance from exchange, the modem your using or how much your hardware likes you on a particular day. Unfortunately short of moving into a location that has it already (there are quite a few now, but they’re still the minority) the wait for it is going to be quite long. There is one technology that is available today that can deliver some pretty impressive speeds so long as your’re within range of a city CBD. The tech I am referring to is, of course, 4G wireless. Now if you’ve been here for a while I’d forgive you for thinking that I wasn’t a big fan of the whole 4G idea especially when its mentioned in the same breath as the NBN. It is true that I believe they’re solutions to different problems but just as the underlying technology alludes to (Long Term Evolution, or LTE, if you were wondering) I do believe that it is the future of wireless communications. Unfortunately I don’t believe that the wireless network would be capable of supporting all the Internet requirements of Australians even if the specification is theoretically capable of it. It certainly has its place though, however. As part of my new position with Dell I was given a laptop for accessing the corporate network but the site I’m currently attending doesn’t have an unfettered connection for me to use in order to do so. Initially I was just tethering to my phone as I have a pretty decent data plan (1.5GB/month) that barely ever gets close to being used and for the most part it worked well. However should I pick up my phone to go somewhere or if my S2 was having a particularly bad day I’d lose the connection, dropping anything that required to be always on (like the VPN). Frustrated I decided to grab myself a wireless broadband dongle and for a cool $130 I got myself a 4G one that had 3GB for the first month. It’s a rather tiny device resembling an overgrown USB stick (and it in fact has a USB stick in it as well for driver installation, pretty neat) so you can imagine I was slightly sceptical about its capabilities to deliver true 4G speeds with such a small antenna. The signal in the area where I’ve used it the most isn’t particularly fantastic either and I was relegated to the NextG network, which is still not bad by mobile broadband standards. However over the weekend I was up in the middle of Sydney on the 11th floor of a hotel in Darling Harbor and I was privy to full bars of signal strength on the 4G network. So like any self respecting geek I gave it what for. And boy did it ever deliver. For regular web browsing the difference wasn’t particularly noticeable but I did see something when I opened up Steam on my laptop to try and get a game configured. The download speed I saw was about 2 MB/second and I figured it was just updating from the cache. It in fact wasn’t and was downloading at those blazing speeds right over the wireless broadband. To put that in perspective that kind of speed is about 4 times what I get regularly at home and I wasn’t even trying to stress the connection fully. In hindsight I should’ve done a speed test just to show you what it was theoretically capable of but just simple Steam download test seemed sufficient enough to prove its value. Unfortunately I feel that the ludicrous speeds I saw are a product of the lack of usage at the moment. 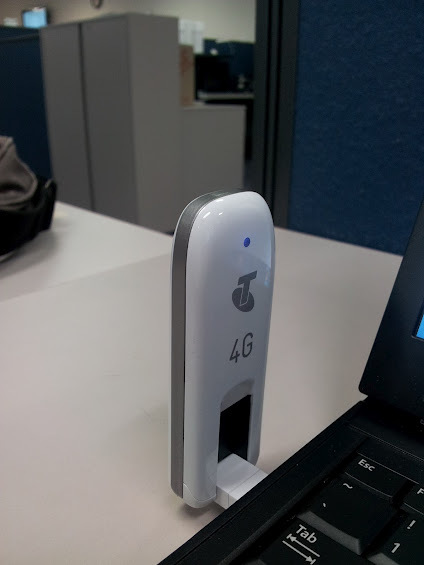 Currently there are only a handful of 4G handsets capable of being used in Telstra’s network and the $130 dongle looks quite expensive next to the $30 3G dongle that’d do the job for pretty much everyone. Whether the 4G network is capable scaling up to the same level of demand that the 3G networks currently have is a question that won’t be answered until 4G reaches a similar level of penetration that 3G has today. With the rapid pace of handset development that could come much sooner than you think and 4G services might become much more commonplace sooner rather than later.